Citing sources familiar with Apple's supply chain, Spanish blog Applesfera reports Apple intends to halt sales of current generation AirPods on March 28. In its place, the tech giant will introduce "a few" new models of the immensely popular accessory, sources said. The report hinges in part on a screenshot purportedly taken from the logistics software of an Apple supplier, which labels AirPods as "Out of Stock" on March 28. While its origin is unknown, the stock listing appears to suggest that a next-generation product launch is imminent. The publication, again citing unnamed sources, claims one or more new AirPods variants will be unveiled at a rumored special media event slated for March 25 before they hit store shelves on March 29. Further details regarding the supposed next-gen AirPods were not furnished in the report. Applesfera lacks an established track record -- or any record -- of predicting Apple product launches and AppleInsider is unable to confirm its claims. Thursday's report adds to a confusing, and perhaps confused, chorus of rumors surrounding a so-called "AirPods 2" device. When BuzzFeed News broke news of the as-yet-unannounced Apple special event earlier this month, the outlet cited sources who believe the tech giant is unlikely to use the opportunity as a platform to debut new hardware. Instead, the media gathering is expected to focus on new video and news subscription services. Previous rumblings suggested a new AirPods version with health tracking features would launch on March 22 alongside "iPad mini 5" and the long-delayed AirPower charging mat. Others claim a promised wireless charging case is set to debut with a minor AirPods hardware update sometime before a product line revamp is unveiled this fall. 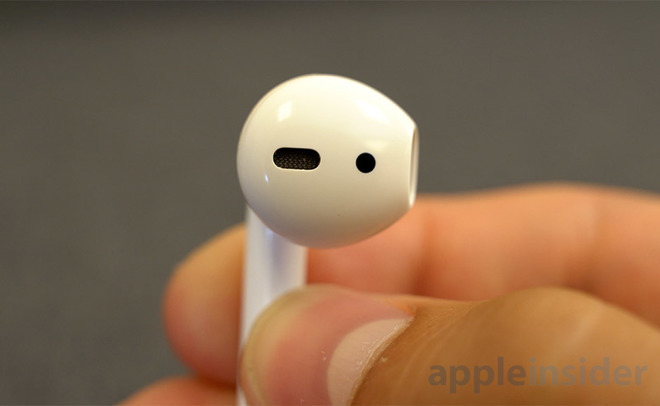 More recently, analyst Ming-Chi Kuo in a note to investors pegged Apple to launch an updated version of AirPods in the first half of 2019, echoing a prediction first floated by DigiTimes in January. My guess is that the new model will be the old model with a better chip and a qi charging case. Then they'll roll out a new set next year that have the heart rate tracking features and what not. Otherwise they'd be smart to keep the old model and just drop the price. Best Apple product released in years! I love my AirPods. Can't wait to see the new ones. Airpod 1 was built probably with Bluetooth 4.2, While Apple releasing AirPod 2 with supposedly Bluetooth 5, enhanced audio and health tech, AirPod 1 should be updated with BT 5 with the same enhanced audio..Two Airpods with different price point and features. Love my AirPods. The only thing I see right now that would compel me to buy a new model would be the addition of active and adjustable noise canceling. That way I could use them on airplanes and hopefully not need to travel with another set of headphones. I thought end of life products just disappeared from the Apple sales portal. Showing an “out of stock” screen says we’re making more come back later to me. Why are you guys obsessed with updating the old models? That makes things complicated and expensive. Not only that, it gives less reason to buy the new version. Do you expect all the latest features in the old cases? Just keep the old models with a reduced priced and make a new version for the current price. They better. My day one AirPods barely last half an hour. That was the old Apple business model. And to be fair why shouldn't Apple raise the price if the feature set is significantly upgraded. Because they already have a lot of money? That's a lousy business model. Well, their model for phones is to introduce a new model at the same price and keep last year’s model with a reduced price. the problem iwith AirPods is that v1 is already pretty good, so there will likely be a significant portion of buyers who either aren’t interested or aren’t willing to pay for the features of v2 and keeping v1 around would canabaize sales. If v2 has decent noise cancellation, I might be willing to consider them. It’s virtually impossible to use non- sealing headphones like Apple’s on an airplane if they don’t have some sort of noise cancellation. Well, it does risk overall lower profits if the number of sales not made exceed the increased margin. Particularly in Apples case if lower priced competitor earphones are “good enough”. then Apple runs the risk of the customer eventually moving out of the ecosystem altogether as the barrier to doing so declined. Which would be really bad for profits. Anyway, I would not be surprised if Apple might have to include the new EarPods with iPhone XS sales. Like the S10 does right from launch. Apple is mid cycle.